Younger brother of Sandi Griffin, older than Chris and with dark brown hair. Described in The Daria Database as: "12 student, brat. Never outgrew the "terrible twos." Likes to pound his brother, kick walls and fill the house with water. Plans to someday marry Quinn." 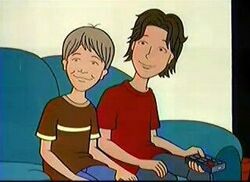 In every appearance, Sam is an uncontrollable, spoiled jerk who enjoys making his sister suffer (including leaving her outside to freeze in "Daria Dance Party"), mouthing off to people, and having fights with Chris. In "Fair Enough", he and Chris enjoyed physically assaulting people at random, and "Dance Party" shows a younger Chris and Sam destroying their sister's creations for the sheer delight of it. Sam and Chris both appear in Wouter's comic "Through a Webcam Lens Darkly" where the brothers decide to go high tech in their quest to get close to the woman of their dreams; unfortunately, their plan is thwarted when their webcam is placed in a different room. In the story he's shown to be the blunt one of the two, more prone to violence and not quite as literate as Chris is. A good example of that is when they find out that the phone isn't in Quinn's room. Seeing this as a betrayal on Sandi's part, Sam storms off while growling that he's going to put hair removal products in her Shampoo while Chris has the common sense to say that he should get the money they paid Sandi back too while he's at it. This page was last edited on 11 August 2017, at 21:06.